The Americas' Mini Basketball Convention closed this Sunday at the Centro de Usos Múltiples, where FIBA awarded medals to all participants, pursuant to the category's philosophy: foster a complete development of the players in their learning process. The event welcomed more than 6 thousand visitors that included players, coaches, parents, delegates, and national and international directives during almost a week in the city of Hermosillo in the Mexican state of Sonora. This great celebration of Mini Basketball saw the presence of FIBA President, Horacio Muratore; FIBA Americas President, Usie Richards; FIBA Americas Executive Director, Carlos Alves; FIBA Youth Commission President, Mario Méndez; Florian Wanninger, Director of the International Foundation (IBF); and the President of the International Youth Commission of FIBA Americas, Mario Méndez. “We awarded medals to 2,800 children in a spectacular environment. It was very exciting and rewarding. The Festival contributed very much to the worldwide Mini Basketball movement. 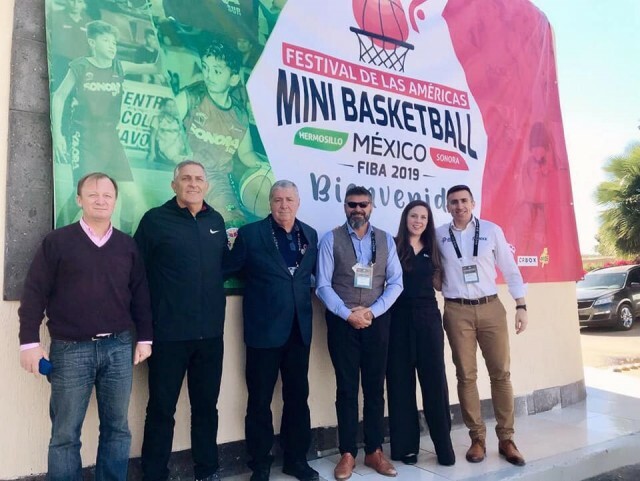 It was very important for me to be able to be present in Hermosillo because in the fundamentals, in these children, and in their love for basketball is the future of our sport,” commented FIBA’s President. The Festival started on Thursday, January 31; and ended yesterday, Sunday, February 3. The children that partook in the event were from 6 to 12 years of age and went to the Festival to represent Puerto Rico, Costa Rica, Panama, Dominican Republic, Cayman Islands, Ecuador, Colombia, Brazil, Honduras, and Mexico, the host country. They played, they had fun, and above all, they learned. “This experience has been very important to showcase and develop my talent, play in a team and practice all the values that you learn thanks to basketball,” said José Miguel Serrano Brenes, a 12-year-old child that represented Honduras. “I learned a lot about this experience, I’ll never forget it. You should always enjoy the game and see the positive side,” added another of the 12-year-olds, Guillermo Quesada, who represented the Costa Rican national team. Also, the International Congress took place in the context of the Festival. It featured nine conferences and five workshops for 25 delegates of national federations and international countries, as well as 400 congresspersons from all Mexican states. It was dedicated to uniting the game at a world level in this category. “I'm very happy that the Festival took place here. Sonora carried Mexico’s and all the continent's flags in a tournament that was very fun and a party for the children. What we seek is joy in the court, as is dictated by the Mini Basketball philosophy,” assured Mario Méndez, COCABA's recently elected President. All conferences took place in the remodeled Gimnasio del Estado — now known as Arena Sonora — with 9 international speakers that explained the essence and philosophy of Mini Basketball. “The purpose of my talks in the Congress was to motivate coaches to develop Mini Basketball. We want children to learn to develop as people and that they're capable to self-regulate and self-teach,” added iCoachKids Project Director Dr Sergio Lara-Bercial. These were four days of a great basketball celebration centered around the Americas’ Mini Basketball, in an environment where fun, learning, love for the game and friendship prevailed.